Learn how to create a solution that compiles for both .NET Framework and .NET Core side-by-side. See several options to organize projects to help you achieve this goal. Here are some typical scenarios to consider when you're deciding how to setup your project layout with .NET Core. The list may not cover everything you want; prioritize based on your project's needs. 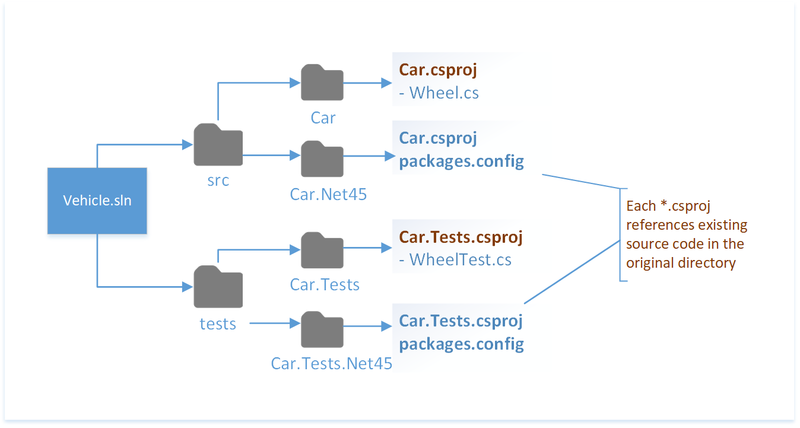 Simplifying your build process by compiling a single project rather than compiling multiple projects, each targeting a different .NET Framework version or platform. Simplifying source file management for multi-targeted projects because you must manage a single project file. When adding/removing source files, the alternatives require you to manually sync these with your other projects. Easily generating a NuGet package for consumption. Allows you to write code for a specific .NET Framework version in your libraries through the use of compiler directives. Requires developers to use Visual Studio 2017 to open existing projects. To support older versions of Visual Studio, keeping your project files in different folders is a better option. Continuing to support development on existing projects without having to upgrade for developers/contributors who may not have Visual Studio 2017. Decreasing the possibility of creating new bugs in existing projects because no code churn is required in those projects. The following describes several ways to add support for .NET Core for this repository depending on the constraints and complexity of the existing projects. Reorganize the repository so that any existing *.csproj files are removed and a single *.csproj file is created that targets multiple frameworks. This is a great option because a single project is able to compile for different frameworks. It also has the power to handle different compilation options and dependencies per targeted framework. Replacement of packages.config and *.csproj with a new .NET Core *.csproj. NuGet packages are specified with <PackageReference> ItemGroup. If there are existing projects that target older frameworks, you may want to leave these projects untouched and use a .NET Core project to target future frameworks. The .NET Core and existing projects are kept in separate folders. Keeping projects in separate folders avoids forcing you to have Visual Studio 2017. You can create a separate solution that only opens the old projects. Please see the .NET Core porting documentation for more guidance on migrating to .NET Core.